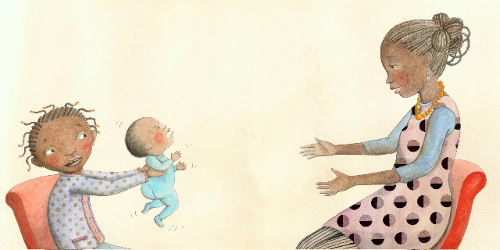 Well, I finally followed up on something I promised I’d try to do in my Caldecott-ramblings post, and that would be contact illustrator Sophie Blackall to see if she wanted to share some images and possibly some sketches from her latest illustrated picture book titles, Jacqueline Woodson’s Pecan Pie Baby and Rukhsana Khan’s Big Red Lollipop. In fact, as you all know, I like to feature student illustrators or those brand-spankin’-new to the field on the first Sunday of each month, but I’m breakin’ the rules today, since I promised this a couple weeks ago and can finally deliver. 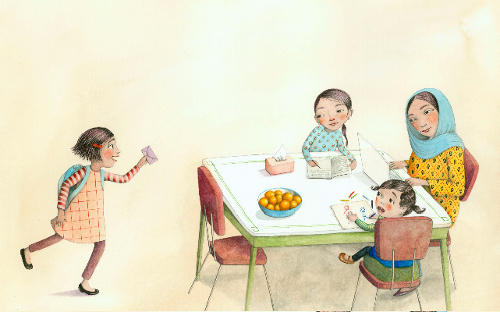 It’s a sweet (but not cloying) and engaging domestic drama, made all the more so by Sophie’s illustrations, rendered in Chinese ink and watercolor. 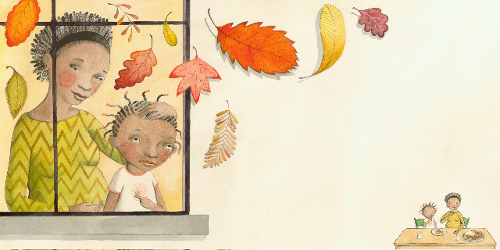 “Blackall’s…stylized ink and watercolor images,” writes Publishers Weekly, “with their muted colors and slightly flattened perspectives, have a strong sense of style and calming warmth.” Sophie knows how to ramp up the emotion while still keeping us feeling cozy at the same time. 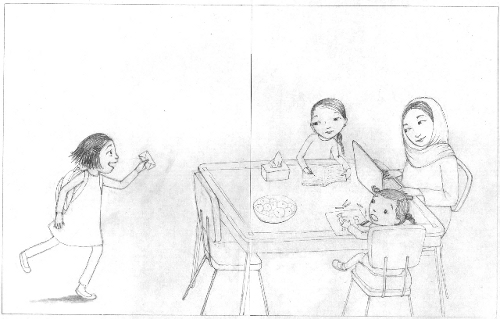 Below are some more spreads from the book (without text), followed by sketches in some instances. It’s been a while since I’ve read this one (and it was a library copy, so I’m going off memory here), but it’s a well-crafted tale of sibling rivalry. Or, as the Publishers Weekly review notes, it’s about more than that. It’s actually about “the hard-won lessons emerging from clashes of identity and assimilation.” The book features a Pakistani family, who have different traditions swirling around birthday celebrations. After Rubina, the young protagonist, gets invited to a classmate’s birthday party and is told by her mother that she must bring along her younger sister, she’s humiliated and mortified at the thought. The book deals with what happens when she follows her mother’s wishes. 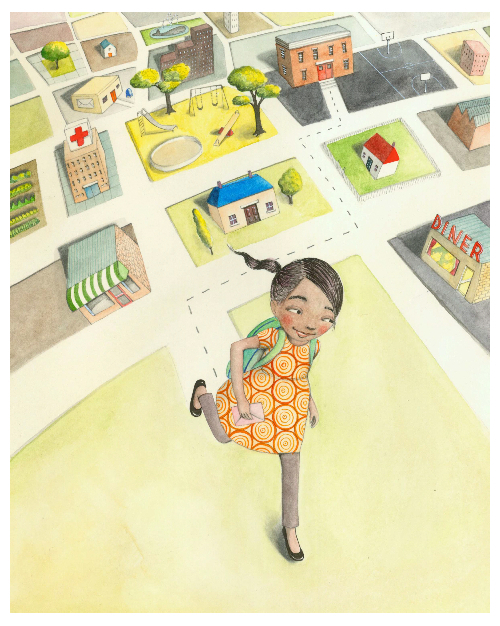 “Dynamic visual design distinguishes this tale of sibling conflict in an immigrant family,” writes Kirkus. 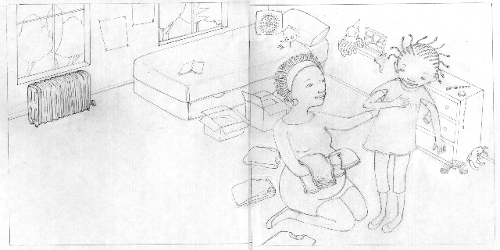 Below are some images and sketches from this title. Enjoy. “Then one day Sana comes home waving an invitation. ‘Ami! I’ve been invited to a birthday party! There’s going to be games and toys and cake and ice cream! PECAN PIE BABY. Copyright © 2010 by Jacqueline Woodson. Illustration copyright © 2010 by Sophie Blackall. Published by G. P. Putnam’s Sons, New York. Reproduced by permission of the illustrator. BIG RED LOLLIPOP. Copyright © 2010 by Rukhsana Khan. 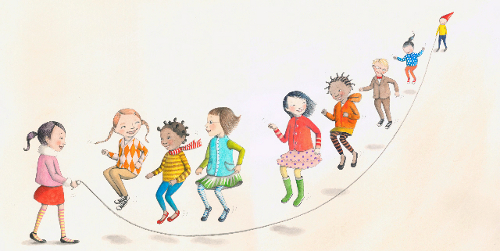 Illustration copyright © 2010 by Sophie Blackall. Published by Penguin, New York. Reproduced by permission of the illustrator. 1). Field trips with the first grader on beautiful Autumn days. 2). Though I grumbled about it impatiently at first, I grew to love HBO’s Carnivàle, all finished up on DVD this week. This is the show once described as “the perfect show for those who thought Twin Peaks was too accessible.” (HA.) It’s definitely like no other show I’ve ever seen. 3). The notion of a Nashville Kidlit Drink Night, à la the New York City ones. More on this later. Wish I’d thought of it myself. It’s an idea whose time has come. 4). My daughter’s teacher consistently sends her home with the BEST picture books for reading homework. Whew. 5). New (sorta) music from Sam. 6). A thoughtful gift from a thoughtful friend. Love her work, and wait till you see what she’s doing for TWINSPIRATION, a book of twin poems which J.Patrick Lewis (a twin) and I (grandmother of twins) have written together. Then pictures are both unusual, charming, and stunning. Yeah Sophie! Those southpaw snippers never make the cut. But the fact remains they always ride the bench. The only just and right way left to go. I LOVE Sophie Blackall’s work! I really want to read Pecan Pie Baby. Pecan pie. Mmm. Lollipops. Mmm. Jules, woot woot woot woot for your third and fourth kicks! Jane, can’t wait to see it. Steven, thanks, as always, for coming here to share poetry. Love the very subject of this one. Congrats on all those screenings. Tarie, thanks for the Pakistani correction. I will fix that in a sec! And WHOA about that comment on your brothers! Wow just wow. Hi there, Sophie! Thanks for sharing your art with us. The cover of Big Red Lollipop caught my eye. 4) When Rose Wakes by Christopher Golden now available in bookstores everywhere! Today’s going to be a busy day. Hopefully, all goes well. I’ll save those items for next week’s kicklist. Jules: That video is fun. I saw it earlier this week and sent it to a friend who loves dogs as much as I love cats. Steven: Kudos and congrats to you and your daughter for walking the walk. Tarie: Wowza! Go, boys, go! Back from Scotland and excited to find all the new treasures in the bookshop. One of the greatest kicks is to come back and have 3 weeks worth of 7-imp postings to catch up on! 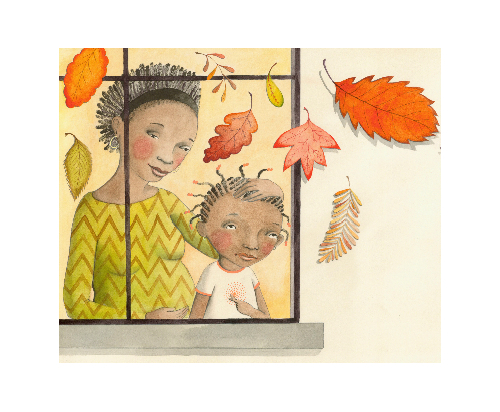 I also loved Sophie’s illustrations from ‘Red Butterfly’ and Rukhasan’s story ‘The Roses in My Carpets’. So many special kicks I can’t keep it to 7 so forgive me and I hope someday you will have a chance to make them some of your kicks. *Sitting on the beach under Castle Tioram and falling in love with the place. Looking across to Eilean Shona and planning my next trip. *Sitting behind a rock with the wind howling as I watched the seals and wondered if the selkie king would come ashore. * Discovering Edradour Cream Liquor and walking back down through the woods past the Black Spout waterfall. *Having a friend stop the car in Glen Loth. We stood and listened to the stillness of the mountain air. Little Willow, enjoy the busy day. When are the callbacks and auditions? Break a leg! Cath, holy moly, your trip sounds as if it was wonderful! I don’t know where to begin, but I must say that Edradour Cream liquor sounds delectable. Sounds like the trip of a lifetime. So glad you enjoyed it! I want to stare at the Big Red Lollipop…It made my mouth get tingly. 3. THe windows are open. 4. I can hear the chickens clucking in my neighbors backyard. 6. The oldest dog and the youngest cat are sleeping together at my feet. 7. And in the midst of this serene moment, the squall of my teen’s discordant angst. I love Sophie’s work and how fun to see the drafts. It looks like everyone is having such great kicks today. 1. Listening to Keeper by Kathi Appelt and about having a heart attack over the tension. I sit in the driveway when I get home and wait until the chapter (or 2) ends. 4. Cybils nominations are open. Have you nominated your favorite book? 5. Watching oldest grandgirl enact the wicked with of the west and then Dorothy. 6. The upcoming writing retreat next weekend. 7. Adult read of the week: Shadow of the Wind. Fabulous! Lindsey,your kicks are altogether a sensory delight. Jone, have fun at that writing retreat. Haven’t read Keeper yet but look forward to it. Sophie Blackall’s illustrations have such fun details. 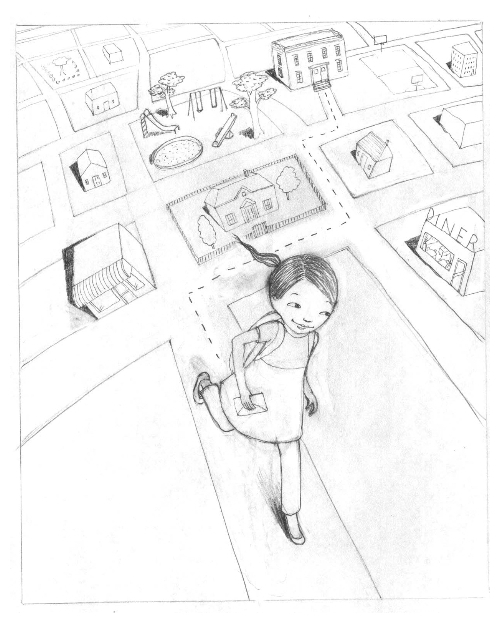 I like the character running out of the map of her neighborhood. And that is really a BIG RED lollipop. Thanks for sharing a lick. 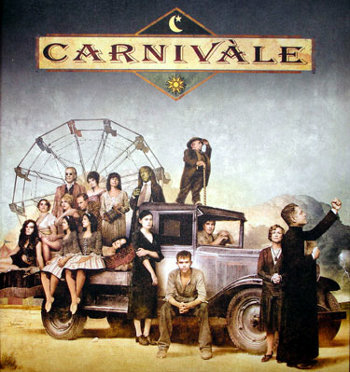 Jules – I never caught an episode of Carnivale, but your kick reminded me that we never exchanged thoughts on The Imaginarium of Dr. Parnassus (which me thinks had a somewhat Carnivale feel to it.) And RE: your daughter’s picture book reading homework. I had to laugh and wonder if her teacher simply reads 7-Imp for great suggestions. Stephen – ah, Irish folk music. From cocky and gleeful — to the saddest songs on earth. And hey, do your “elsewhere” screenings include any on the west coast? Tarie – best of luck to your poomsae champs. Cath – I’m considering spending Christmas in Edinburgh. Your kicks made me lean toward that decision even more. Lindsey – serene moments + teens. Ha! Jone – Thanks for the Cybil reminder. Enjoy your retreat! 1. Presentation at children’s authors faire went well. 2. Met and spoke with writers I have admired. 3. The Cerritos Library is just the most amazing, well-thought out, beeoootiful place! I want to live in the children’s section – under the banyan tree. 5. kept working even though my desk was a mess. 6. kept working even though my sleep and schedule were askew. October is here! Enjoy the week everyone. Jules, that video is so much fun! And the autumn field trips sound fun too! Tarie – woot woot to your brothers! LW – keep us posted, and rock those auditions! Lindsey – love how much Kick 7 contrasts with 1-6! Jone – isn’t the fall sunshine the best? Steven – hooray for that walk with your daughter! Cath – your whole trip sounds amazing! Denise – loved 5, 6 and 7! 1. Scored the winning goal in my Sunday pick-up soccer game today! It was fun because everyone else is so much better than I am, but I’m scrappy, so it works out. 2.Had to move offices at work this weekend for a section shift. Got almost all my pictures hung in the new office this afternoon, so decorating is almost done. 4. Dogsitting my sweet Caloi for 2 weeks started this weekend – yay! 6. Caloi sacked out and snoring on the bed. 7. Kitty purring in my lap. Denise, I’ve heard good things about that Facebook movie — actually, I just heard about it and liked the premise. So glad your presentation went well. And you keep on keepin’ on with your working. Rachel, the scrappy comment made me smile. Give that Caloi some sweet hugs. Sophie’s artwork is gorgeous! Thanks so much for posting.